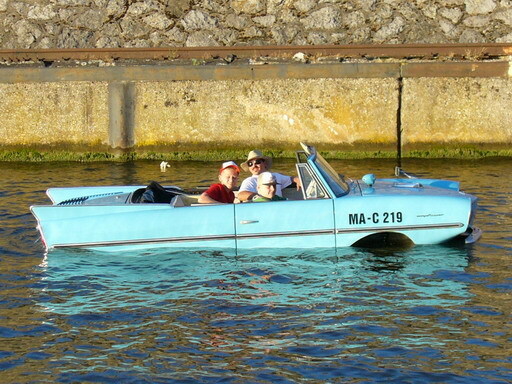 I just read the other day that President LBJ had an Amphicar and took some guests in the car once... He didn't tell the guests that the car was amphibious, either. Regarding NASA, see Wingslinger's informative comment on the Mercury space program page. saw one in Hannibal, MO in the sixies, the guy taking people to the flooded areas during a spring flood in the business district, saw a couple more over the years, there is a online club for these vehicles, I wonder did you have a car license and a boat license on them? Saw one at a boat show. Sooo cool. When I was about 12 or 13, an Amphicar dealership was right near our house. I used to ride my bike over there just to look at them. I thought they were just the coolest thing!